29498 ungebraucht (hinged) * gestempelt (marked) ungebraucht ohne Gummi (unused without gum) (*) 1866/93, small dragons to jubilee inc. dues, mint and used specialized collection on pages in boxed Lindner-album. 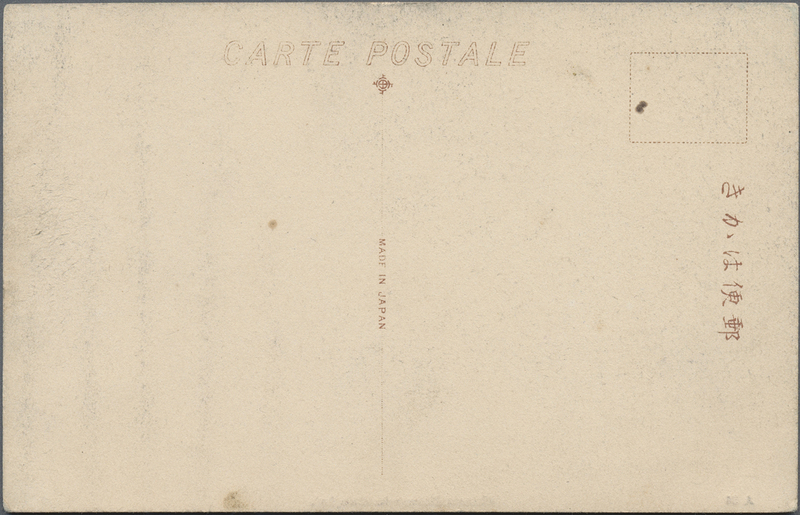 Inc. 1866 2 C. rose perf. 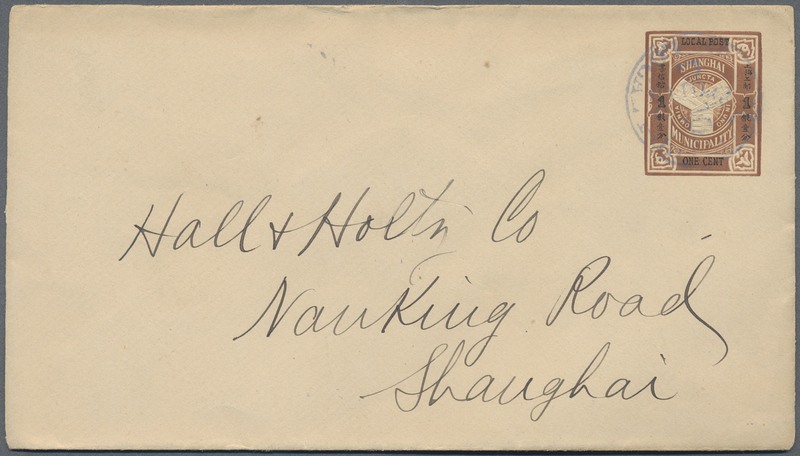 15 used small red garter type pencil sign Benzinger, 1867/76 3 Ca. 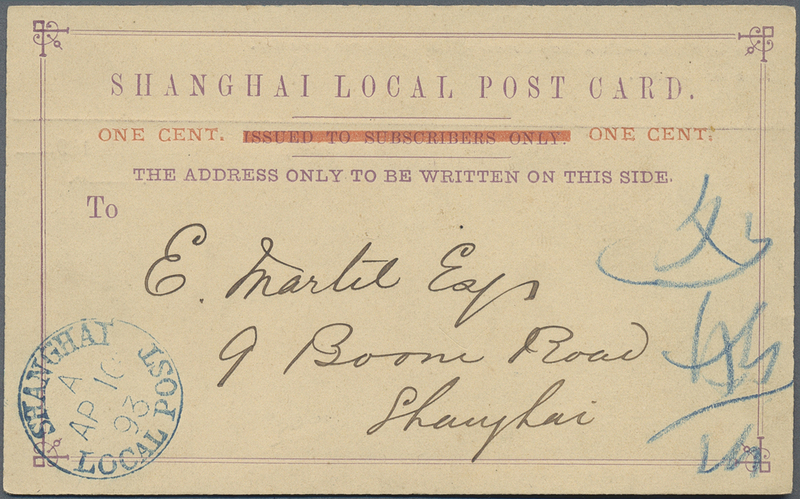 yellow mint with defective "3" (SG 38a), 1873/77 1 Can. 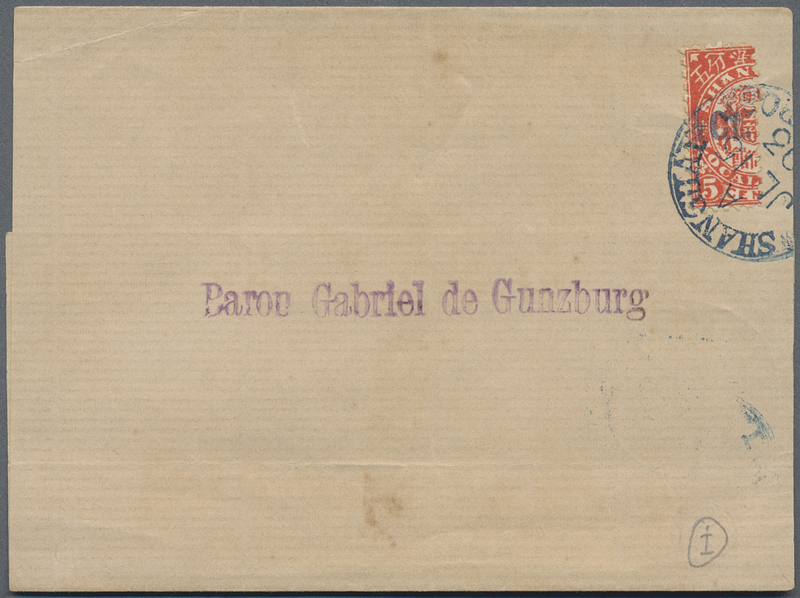 in blue on 6 Cand slate used small red garter on piece signed Stolow, 1 Cand. blue on 9 Cand. mint ng signed Thier, the dues inc. 2 C. #1 mint and used on piece, ovpt. 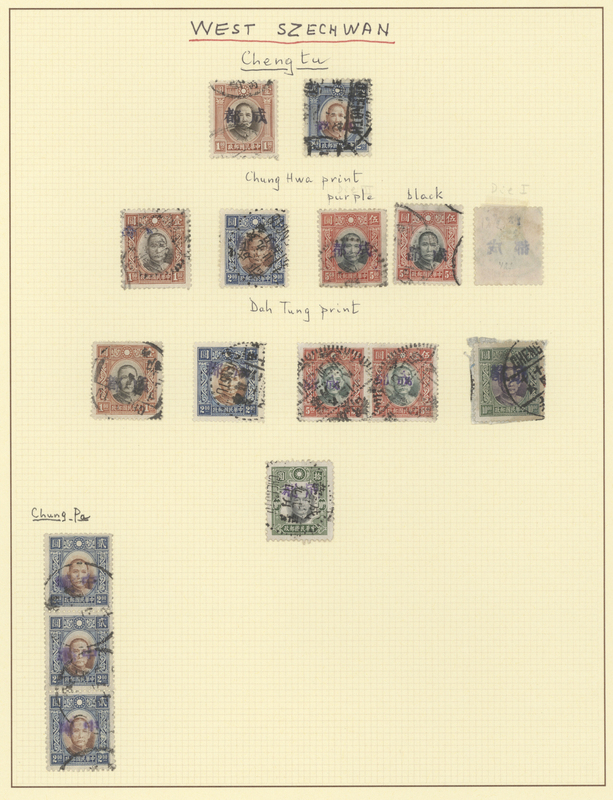 in blue on 15 C. mint, in black on 10 C. orange mint and used plus flag regular/due issue imperf. proofs on thick unwk. 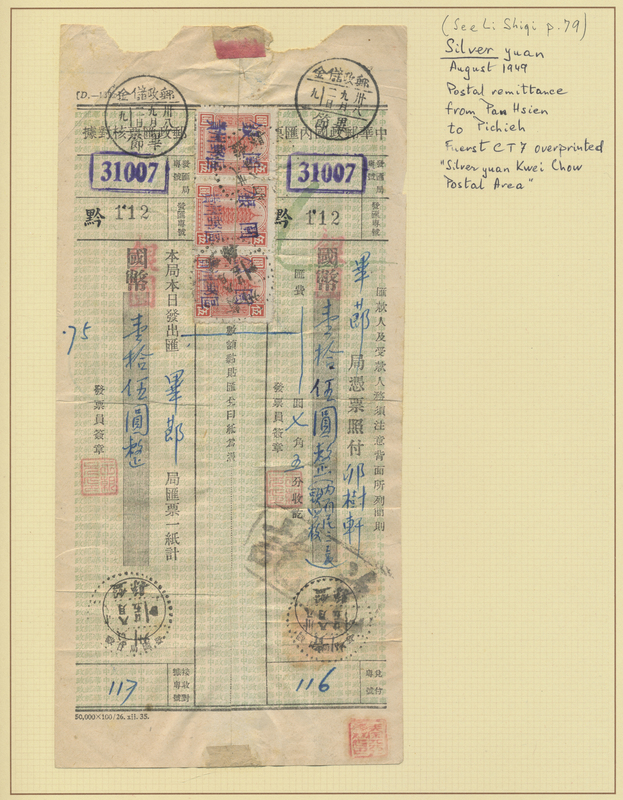 paper total 12 values. Finally appendix with 4 pp. of forgeries, merits a close inspection. 29499 ungebraucht ohne Gummi (unused without gum) (*) ungebraucht (hinged) * 1870s (ca. 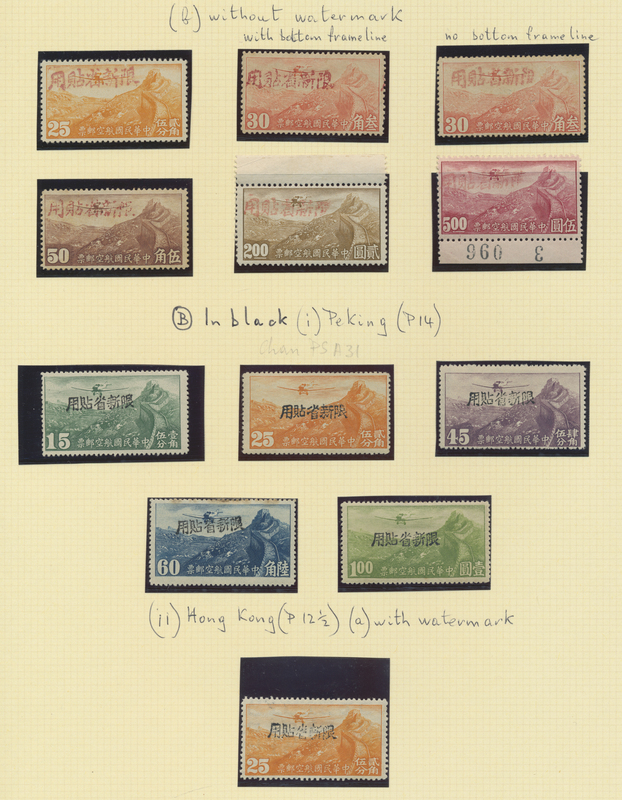 ), so called "Post Office Reprints" (Livingstone Dies II and III), unused no gum: 1 Ca. blue die II (thins) 1 Ca. 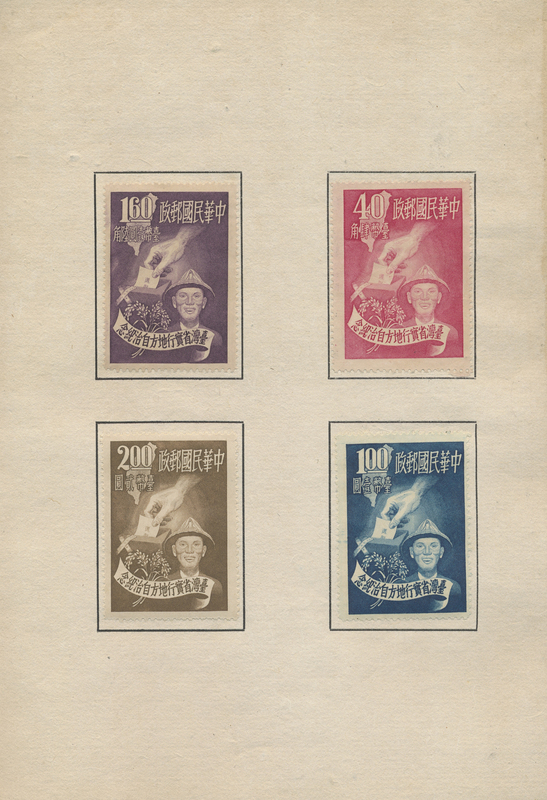 light blue die III (2, one tiny thin), 2 Ca'reens black die III single (gummed) and a horizontal pair die III-II. Plus Liv. PF2 on piece, later use as cancel, as is. 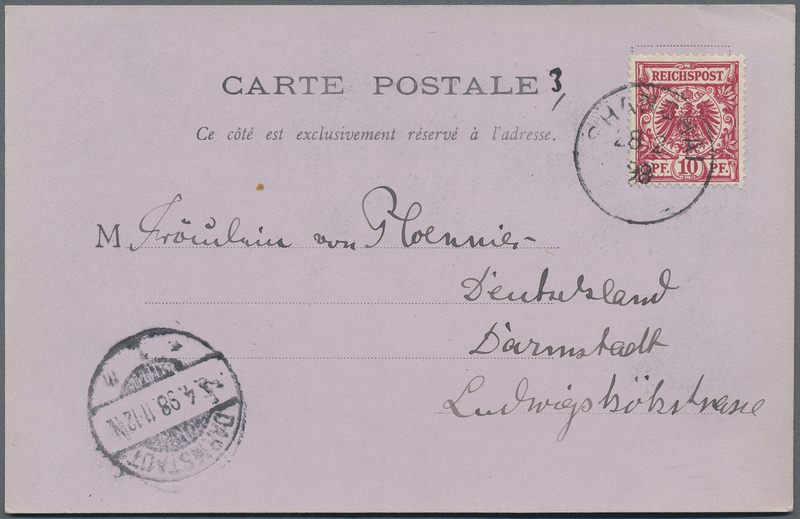 29500 Ganzsache (Complete) 1873/1894, 22 stationery postcards and letter cards unused in mixed condition. 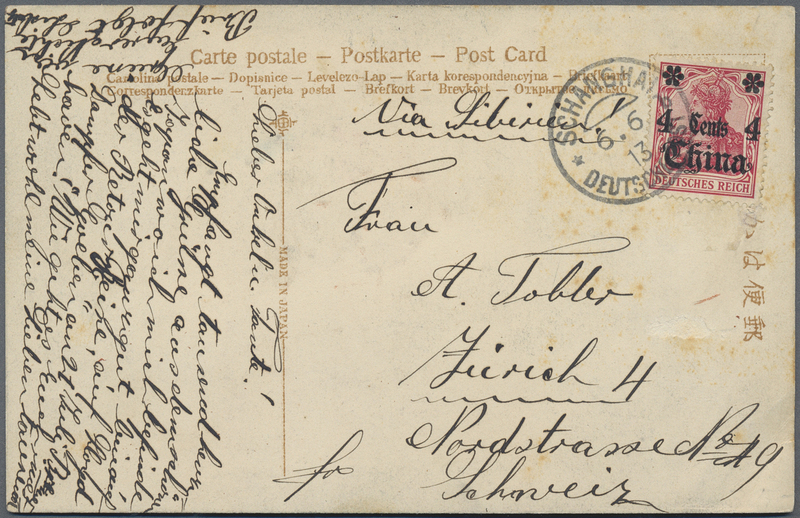 29501 Ganzsache (Complete) 1873/1894, 22 stationery postcards and letter cards unused in mixed condition. 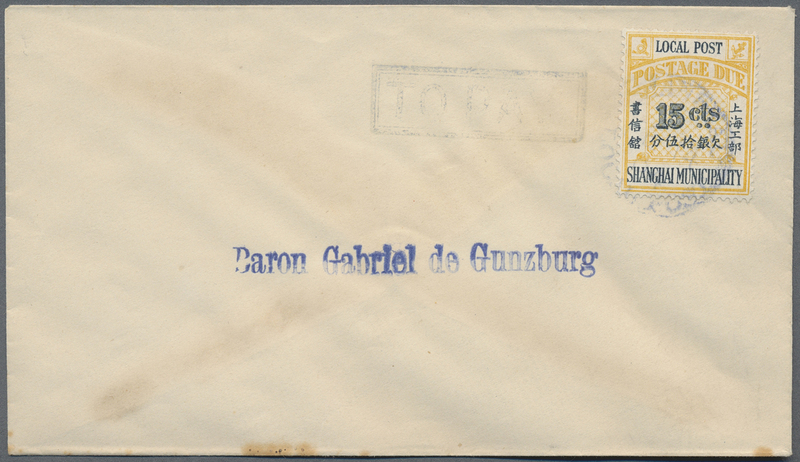 29502 Ganzsache (Complete) 1873/1894, 25 stationery postcards and letter cards unused in mixed condition. 29503 ungebraucht ohne Gummi (unused without gum) (*) ungebraucht (hinged) * gestempelt (marked) 65/69, 70/72, 73/82 1877/88, small dragon in Cash inc. surcharged, unused no gum (51 inc. mounted with gum) and used (11) on stockcards, mixed condition (Michel cat. ca. 1237.-). 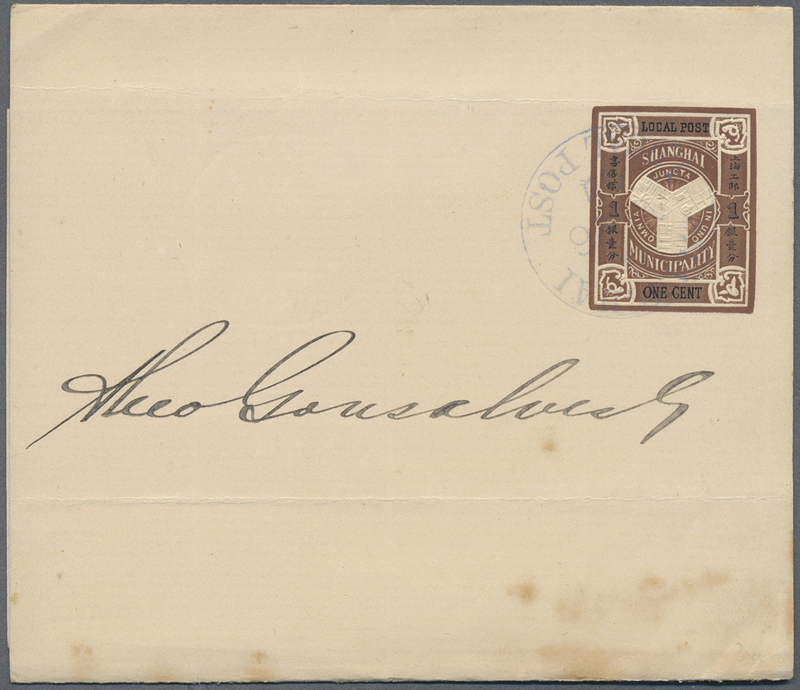 29504 Ganzsache (Complete) 1878/1893 (ca. 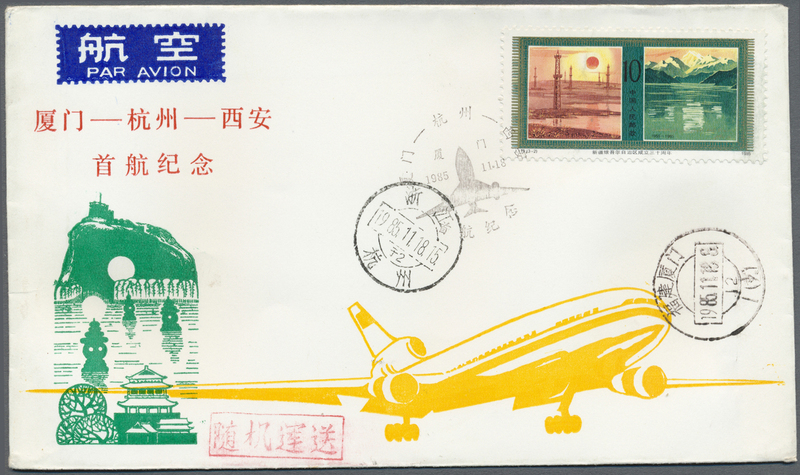 ), collection of mint/used/cto stationery on pages inc. cards (16), envelopes (13), wrappers (10), letter cards (2). 29505 ungebraucht (hinged) * ungebraucht ohne Gummi (unused without gum) (*) gestempelt (marked) 83/95, 86/91, 92/96 1879/89, cash surcharges (65 inc. 40 cash blue on 100 C. x48) and wmkd. small dragon (9), used (3) otherwise unused mounted mint or no gum, mixed condition (Michel cat. 1260.-). 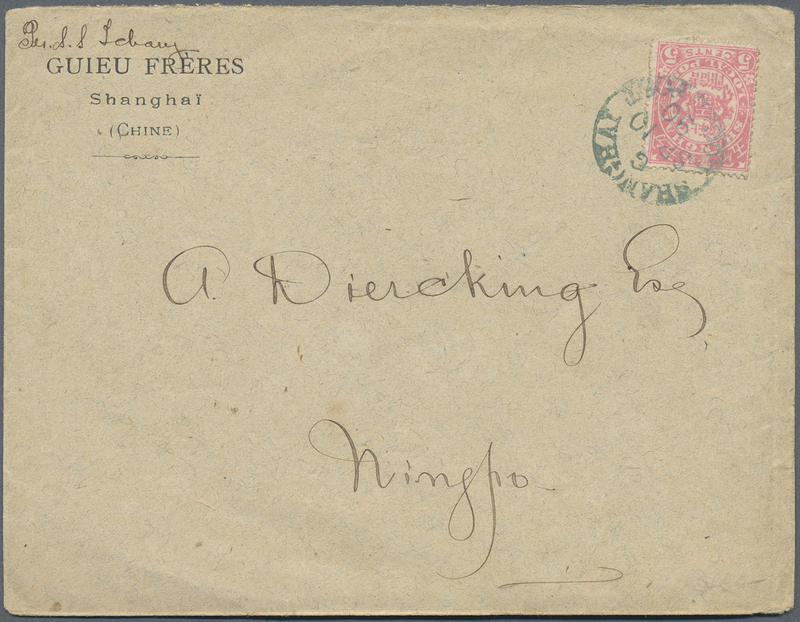 29507 Brief (cover) 1890/93, four covers (inc. one wrapper), three with surcharged bisects and one with 5 C. rose to Diercking/Ningpo and arrival "CUSTOMS NINGPO"
29508 Brief (cover) 1893, 2 C. green bisected used as postage due on local cover backstamped "SHANGHAI B MY 23 93" (see note after SG146). Plus to two covers with 2 C. resp. 15 C. dues. 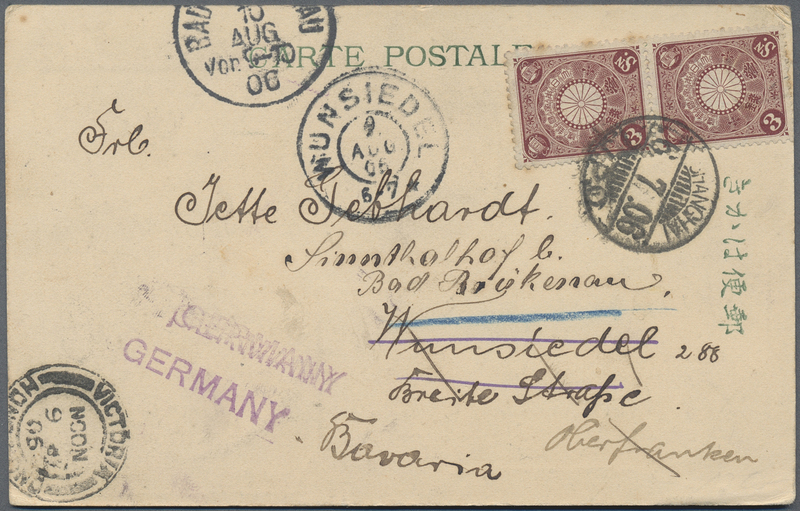 29509 ungebraucht (hinged) * gestempelt (marked) Brief (cover) 1/32 1927/29, junk/reaper/hall 1/2 C.-$5, cpl. 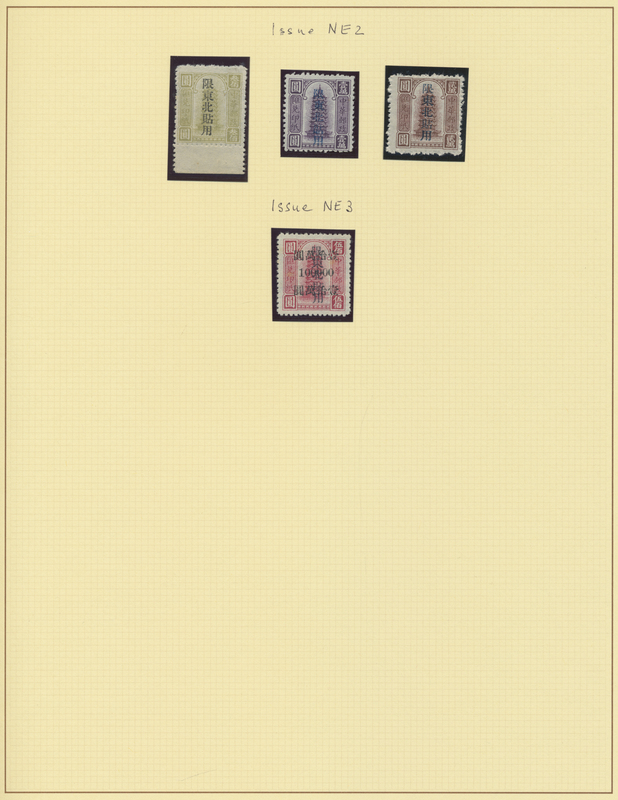 set unused mounted mint, some small denominations up to 10 C are MNH, ex-are top margin copies. Plus 1/2 C.-$5 used, cover and two ppc. 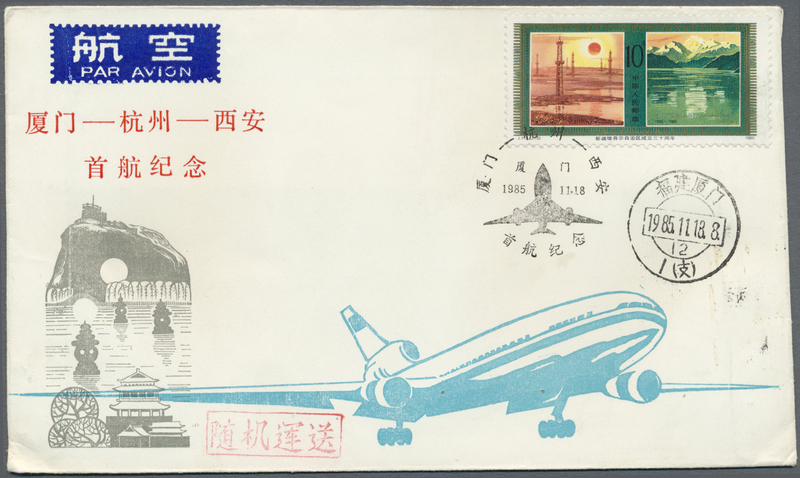 Also commemorative sets unused mounted mint first mount LH resp. 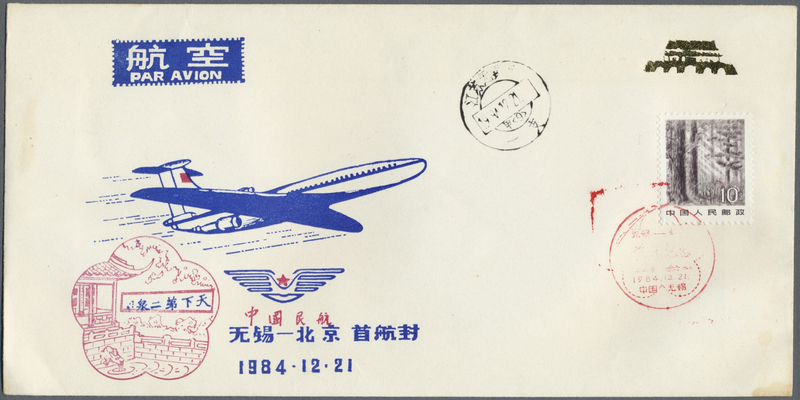 used (unification up to 10 C.), Finally 1 C./6 C. junks with bilingual handstamp "T", these as is and included as reference only. Michel cat. ca. 1589.-. 29510 ungebraucht (hinged) * ungebraucht ohne Gummi (unused without gum) (*) gestempelt (marked) 1918/43, "official usage perfins" on junks/reaper/Hall up to $2 (mint 3, used 35) resp. 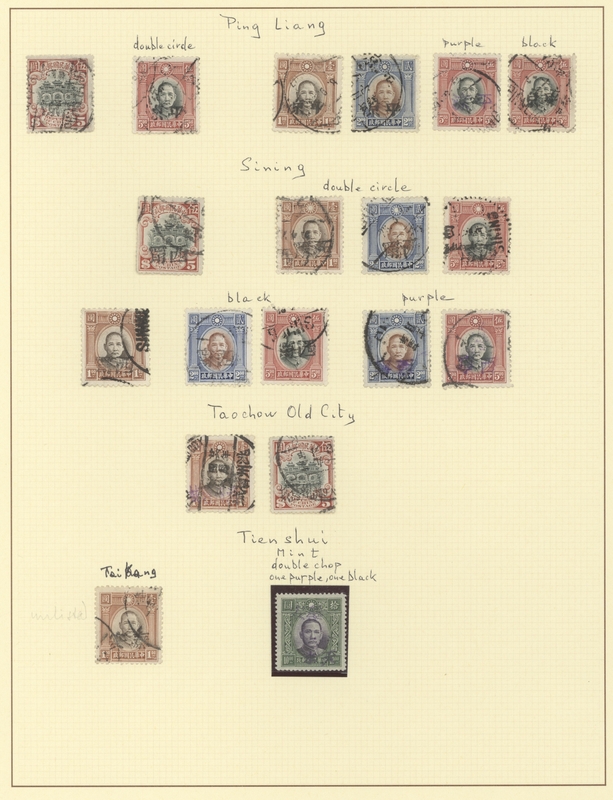 SYS/martyrs (mint 26) on two pages. Total 54 copies. 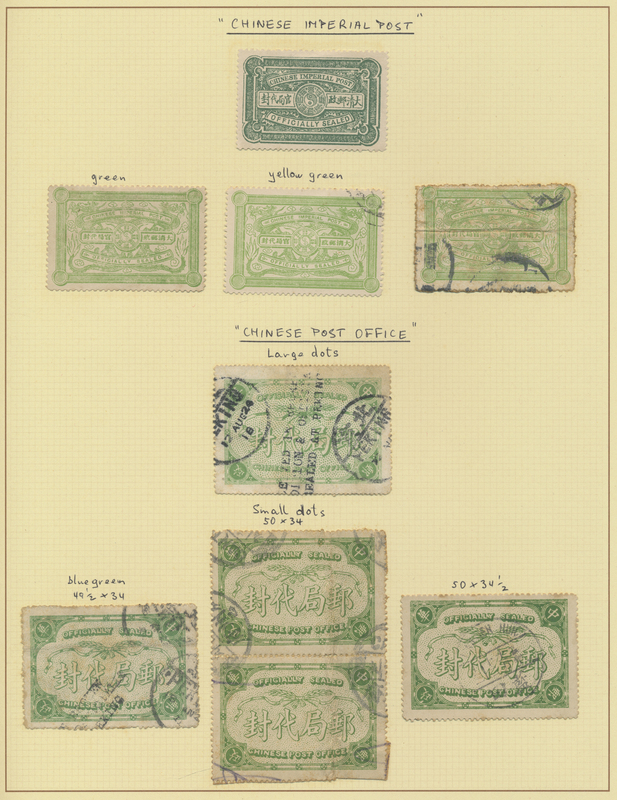 Mint copies, particular of the 1915/26 series, are scarce. 29511 ungebraucht (hinged) * gestempelt (marked) 66/82, 91/102, 104/4 1932/44, SYS and SYS revised resp. 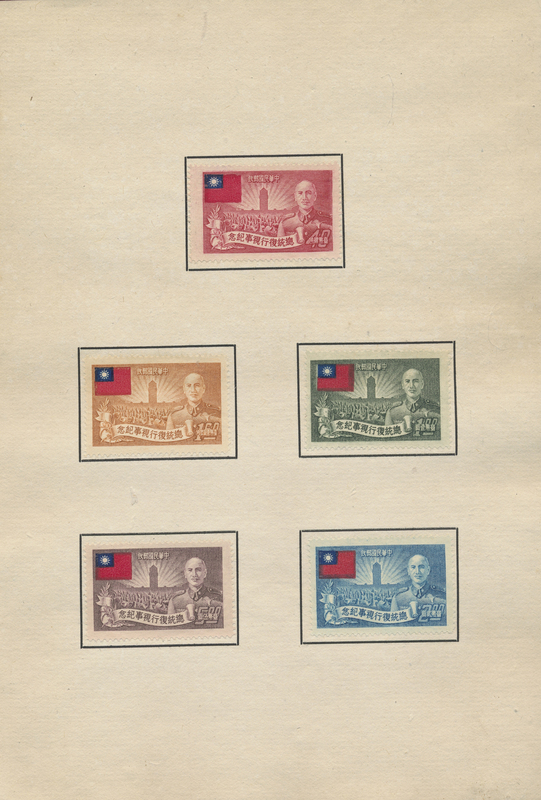 martyrs, unused mounted mint first mount LH or no gum as issued, inc. 1943 §10 with double print of the basic stamp; plus used (32) ex-1932/41 SYS/martyrs, Michel cat. ca. 750.-. 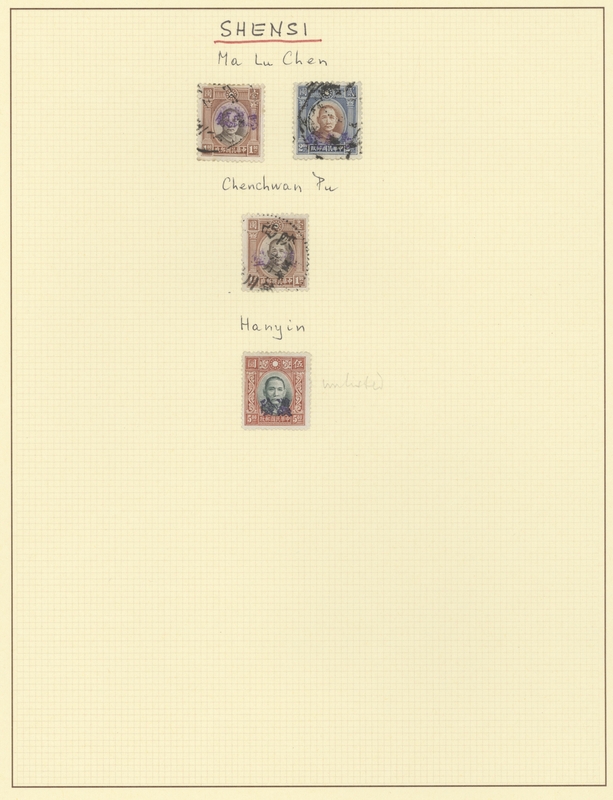 29512 postfrisch (never hinged) ** ungebraucht (hinged) * 1942/44, airmail overprints in red or black, mounted on pages and identified, total 44 stamps mounted mint or MNH, as is. 29513 ungebraucht (hinged) * ungebraucht ohne Gummi (unused without gum) (*) gestempelt (marked) Brief (cover) 1/23-ex 1933, junks/SYS/martyrs, cpl. 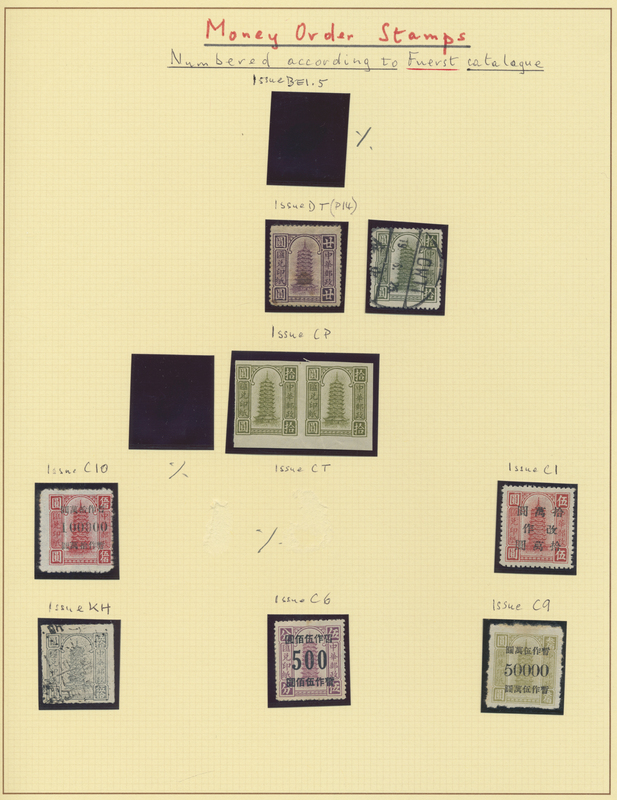 sets: unused mounted mint or partial gum, SYS set however first mount VLH; and used with additional copies for surcharge varieties. 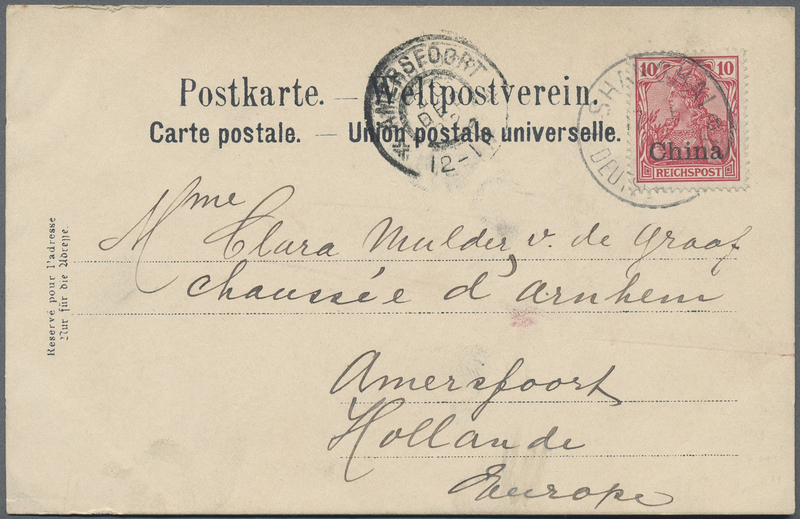 Plus two covers, 25 C. resp. 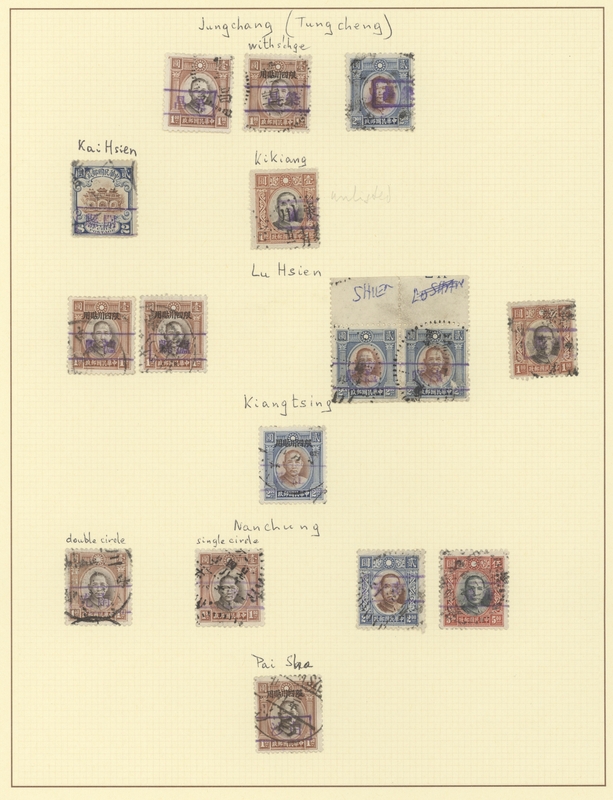 5 C.+25 C. used "KANGTING" to Austria (Michel cat. ca. 550.-). 29514 ungebraucht ohne Gummi (unused without gum) (*) ungebraucht (hinged) * gestempelt (marked) 1949, silver yuan ovpt. 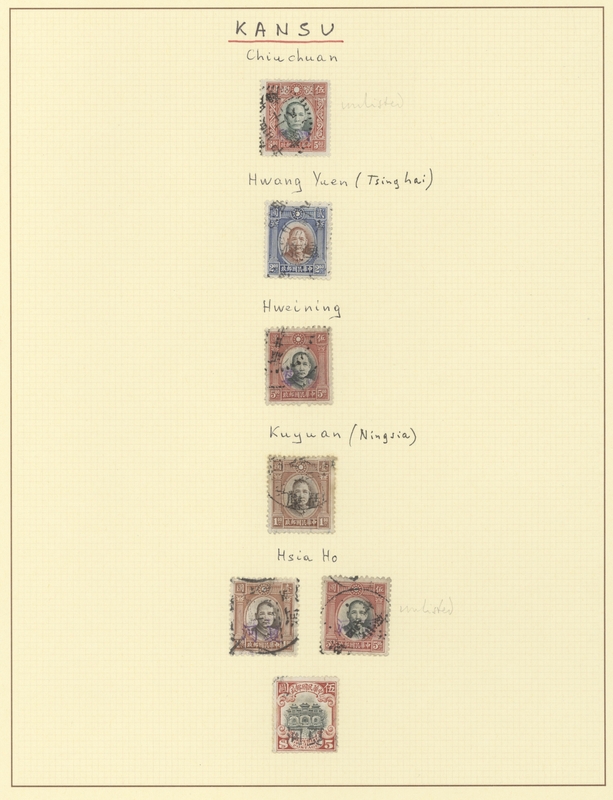 issues for Fukien, Hsi-Kang, Kang-Ting, Szechwan group, Nai Kiang, Nankiang etc. 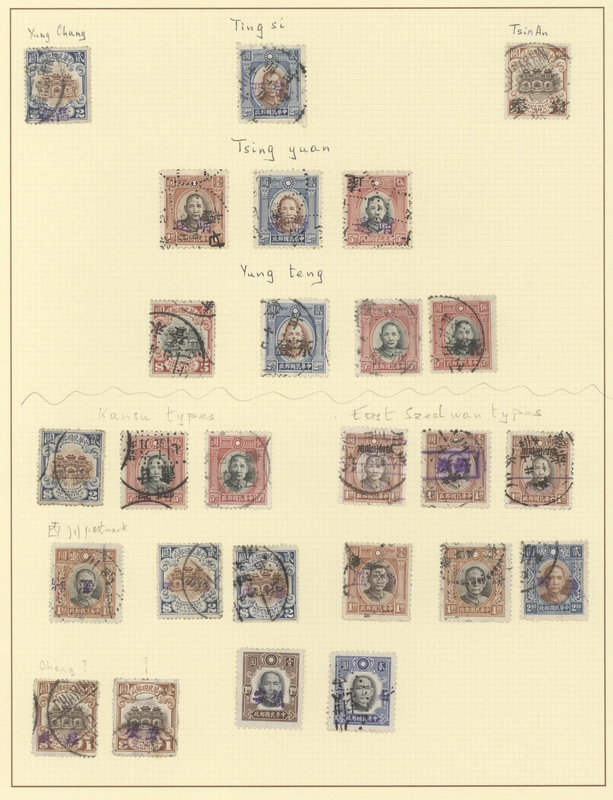 mint and used, mounted on 27 pp., also group of Shensi and Kansu locals on stock card, in boxed Lindner album, as is. 29515 Ganzsache (Complete) Han 1/55-ex 1897/1945, collection of mint and used (inc. uprates) stationery cards, total 58 items. 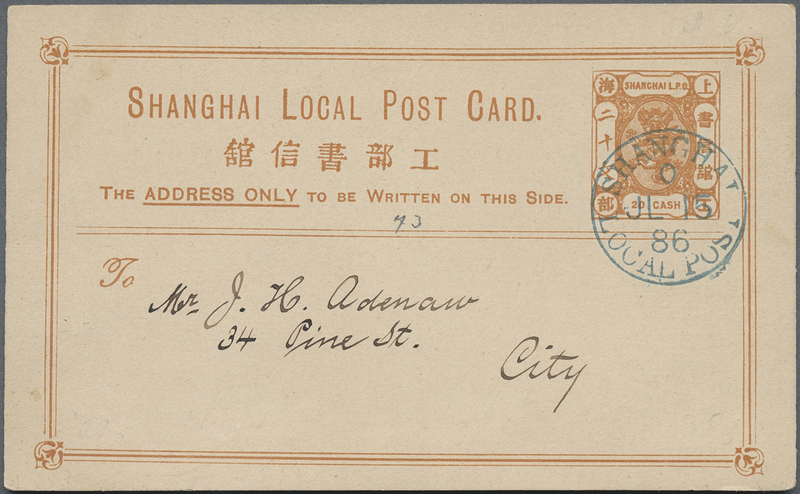 Inc. 1898 ICP reply parts uprated to overseas (2), dragon 1+1 reply mint, same with ovpt. 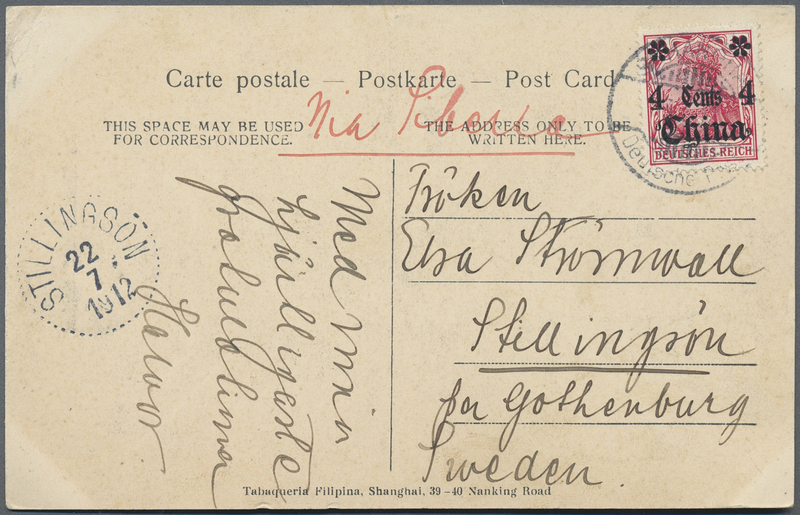 mint, UPU 4 C. used Kwangtung.Nyenhang 1920 to Italy, 1918 1 1/2 C. with Chekiang tombstone, mystery SYS card 1 C. green (design of Han 41 which is orange), UPU cards SYS 12 C./15 C. inc. the rare double card mint ec., to be inspected. 29516 Ganzsache (Complete) Han 10; 79 etc. 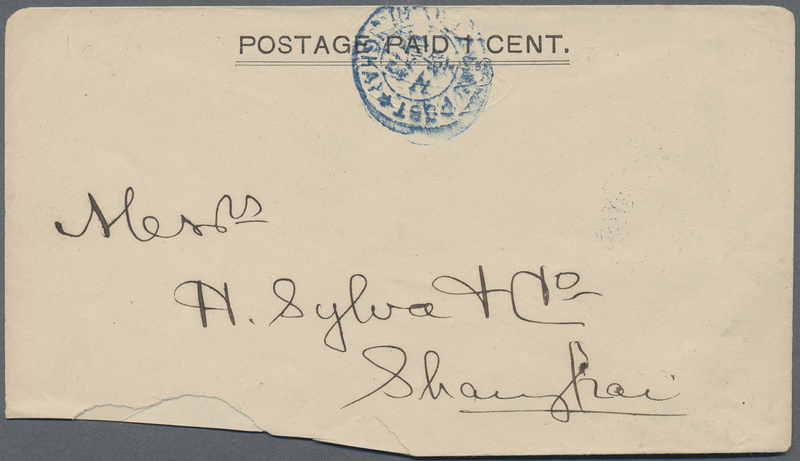 1912, flag card 1 C. uprated commemorative 2 C. and Waterlow ovpt. 1 C. canc. 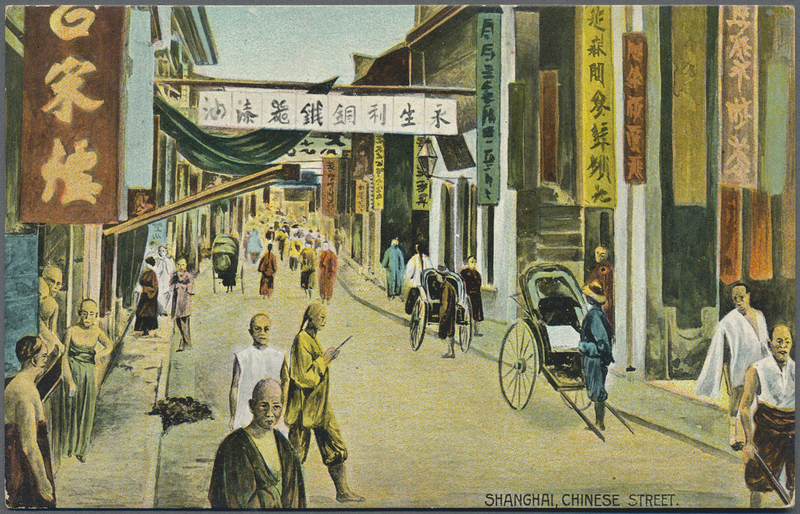 boxed "SHANGHAI 2.5.19" (May 19, 1913) via Siberia to Germany, attractive painting on reverse. 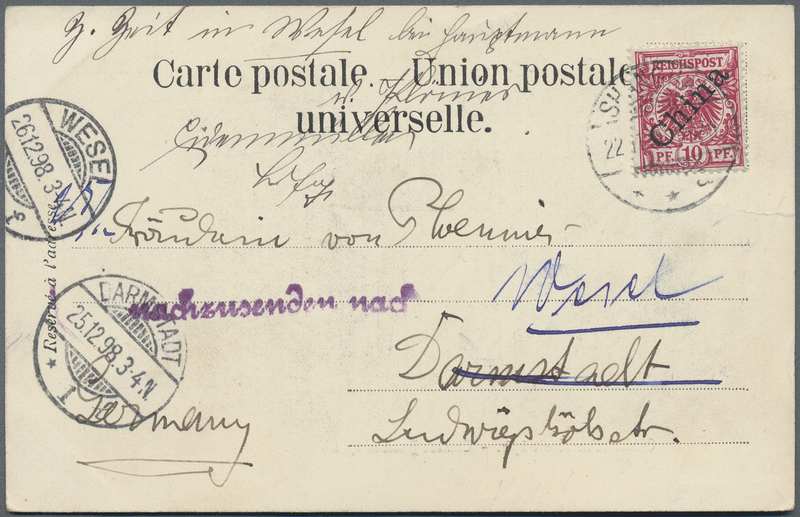 Sender writes in german: "peacefully united, imperial and republican stamps". 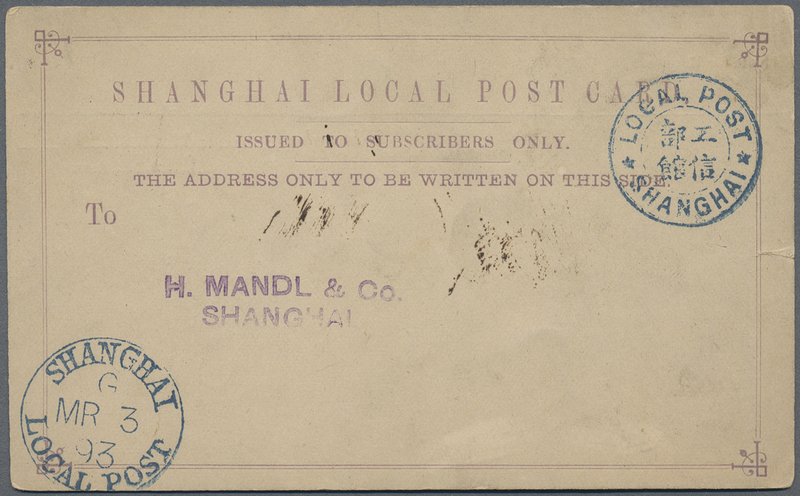 29517 Ganzsache (Complete) Han 64/93-ex 1947, postcard $50 provincial surcharges (14), collection mint (one cto) of Hopeh, Hunan, Kwangtung, Shenshi, West Szechuan and predominantly Yunnan. 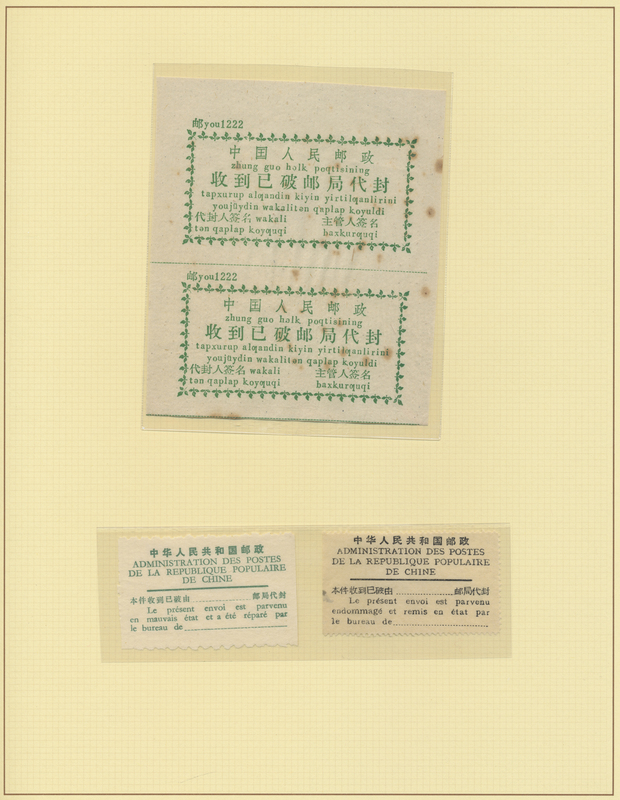 Also mint $250 surcharges (3) of Peiping and East Szechuan. 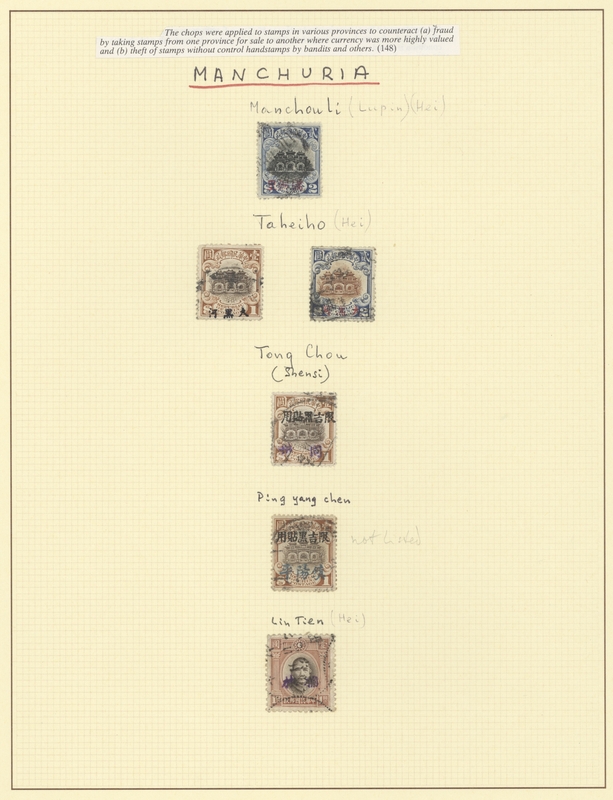 Total 17 cards (Han 64, 65, 69, 76, 77, 80/87, 89; 90, 92 93 ). 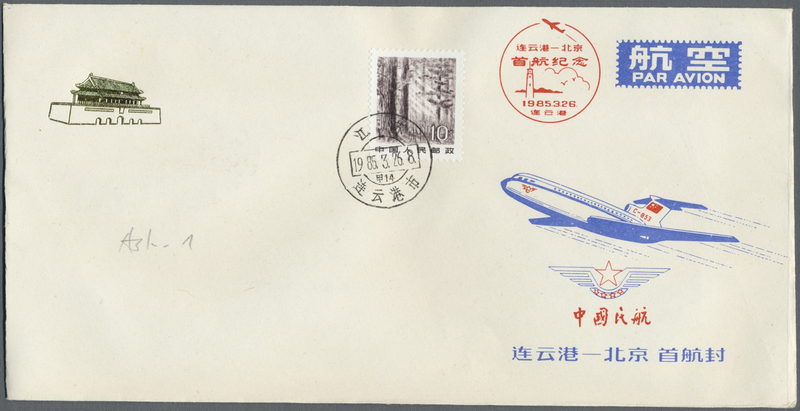 29518 Brief (cover) 1984 - 1996: Collection Domestic First Flight Covers of the PR China. 500 items - all different. 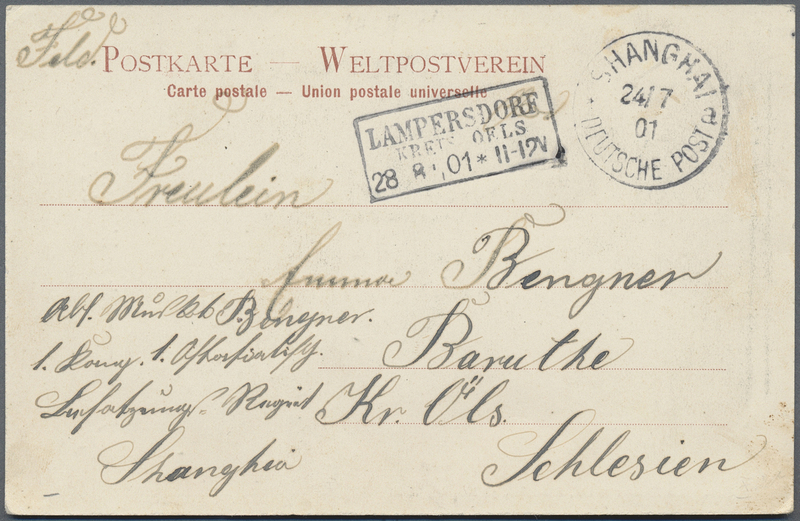 29519 Brief (cover) Ansichtskarte (Picture postcard) 1904/05, Tientsin: military origin covers (4+front cover) or cards (2) some endorsed "Corps d'occupation d'Chine" to France, including 3 stampless. 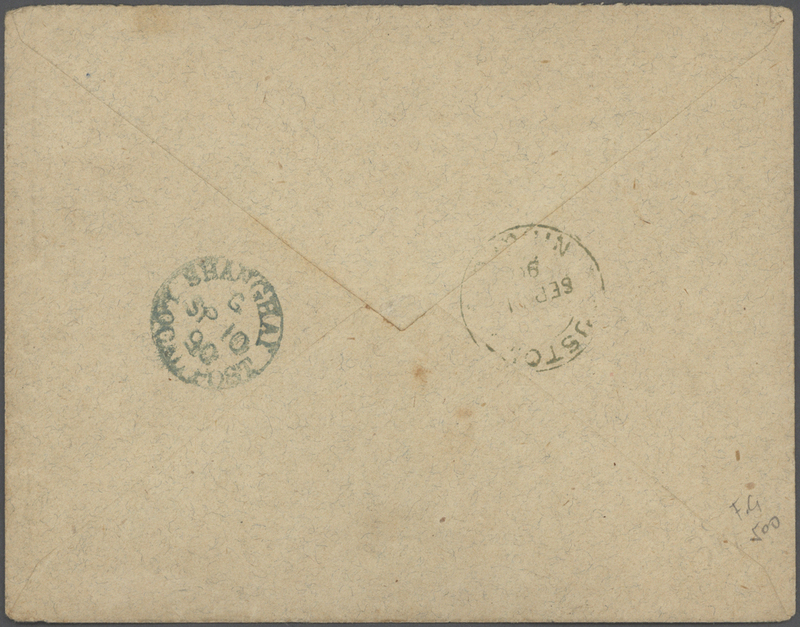 Plus 1938 stampless navy mail (anchor) envelope. Total 8 items. 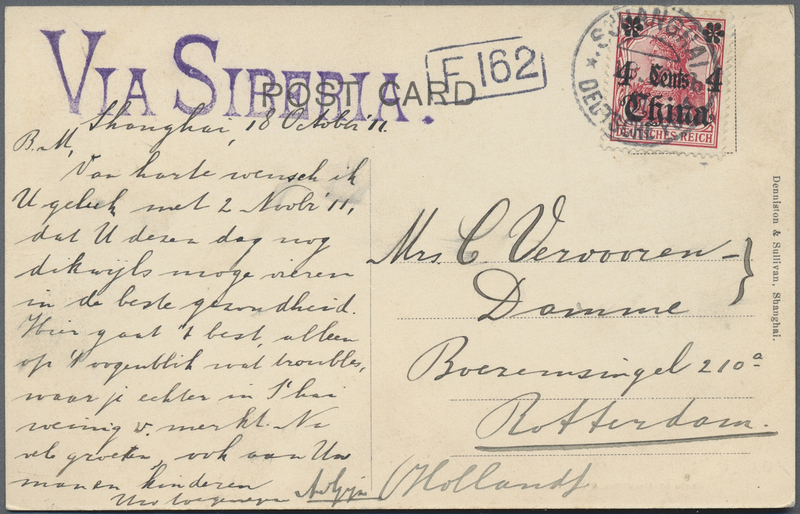 29520 Ansichtskarte (Picture postcard) Germany, 1898/1914, ppc (6 inc. two Hirsbrünner) mostly to Germany and from v. Ploennitz correspondence, one forerunner, three ovpt., boxer war field post stampless and Germany 10 Pf. 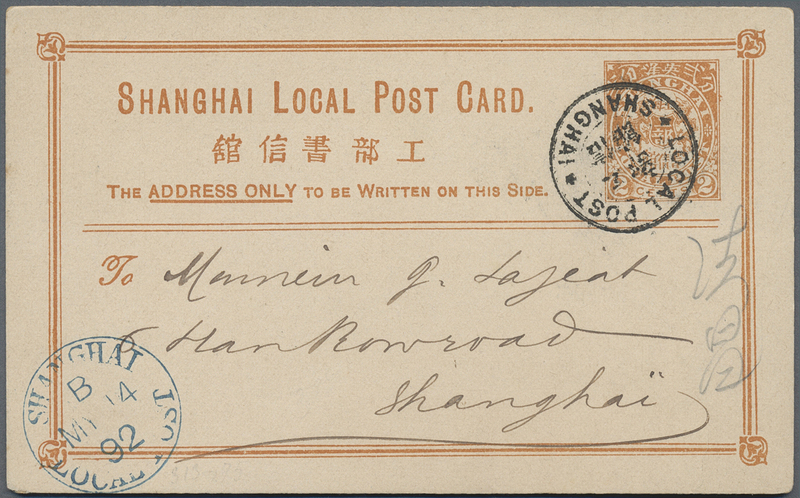 tied "German Seaposts / East Asia Line b 5/4 14" to Nössler ppc showing Wan-Shau-Shan pagoda. 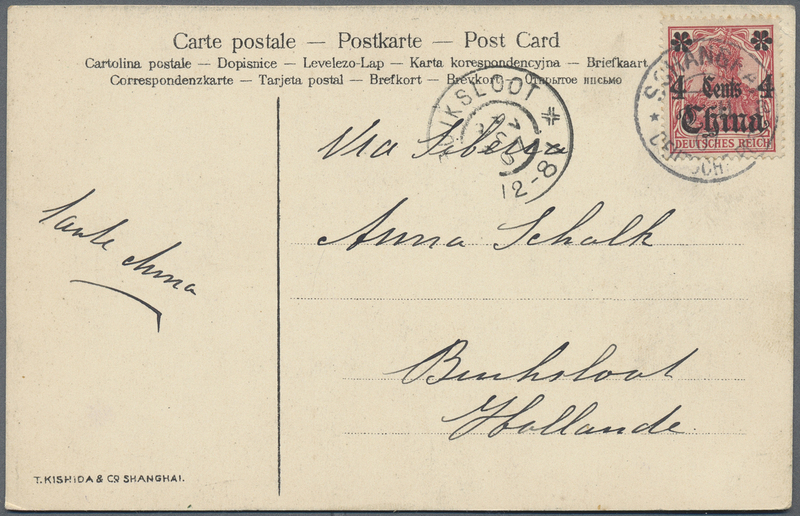 29521 Ansichtskarte (Picture postcard) Germany, 1906 ppc (5) to Switzerland, Netherlands and Germany; also from Shanghai IJPO (1) to Bavaria and one mint. Total 7 items. 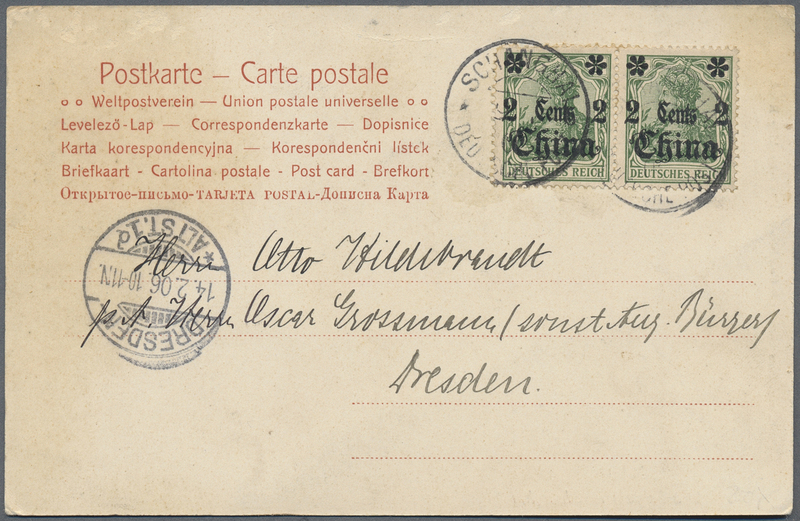 29522 ungebraucht (hinged) * ungebraucht ohne Gummi (unused without gum) (*) gestempelt (marked) Brief (cover) 1899/1950 (ca. 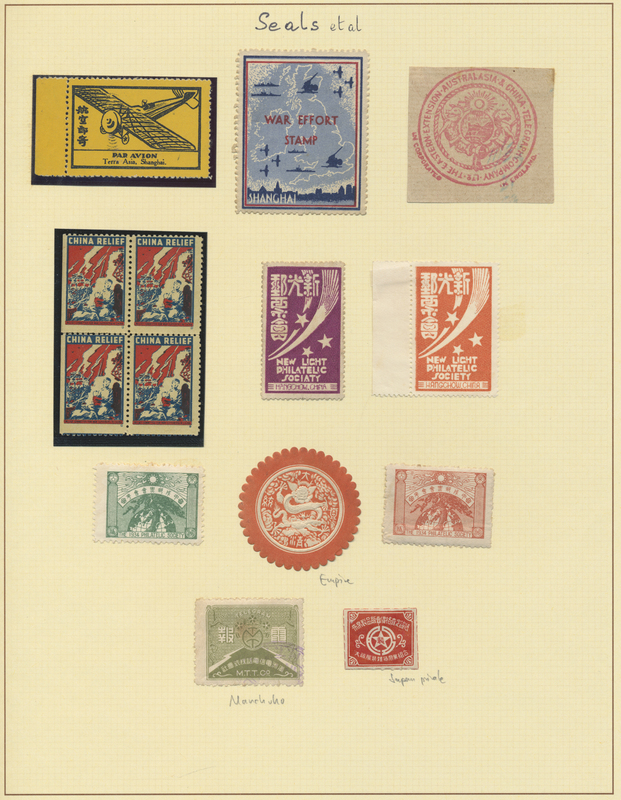 ), revenues/fiscals/tax stamps of Empire (one page) and Republic (57 pp) the latter inc. surcharges for the North-East ec. 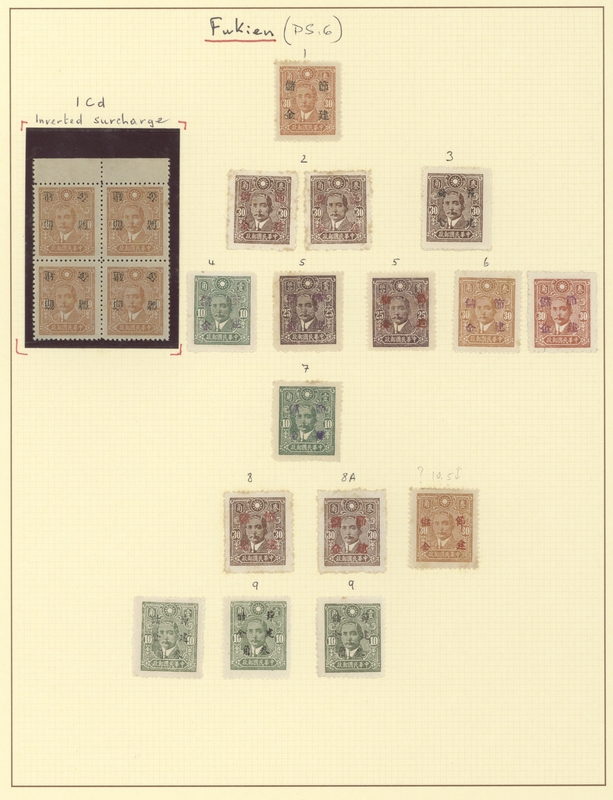 Includes many pairs, blocks-4 or larger, on piece and 33 usages on document. 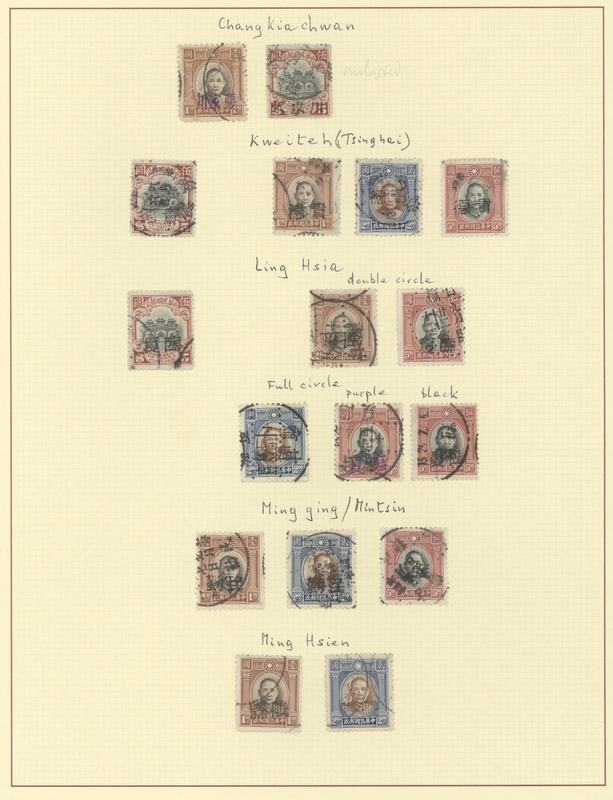 All stamps indentified by catalogs of A. W. Bendig ("R-") or Chi Wen Yan (no prefix). A labour of love in boxed Lindner album. 29523 ungebraucht (hinged) * gestempelt (marked) 1900/60 (ca. 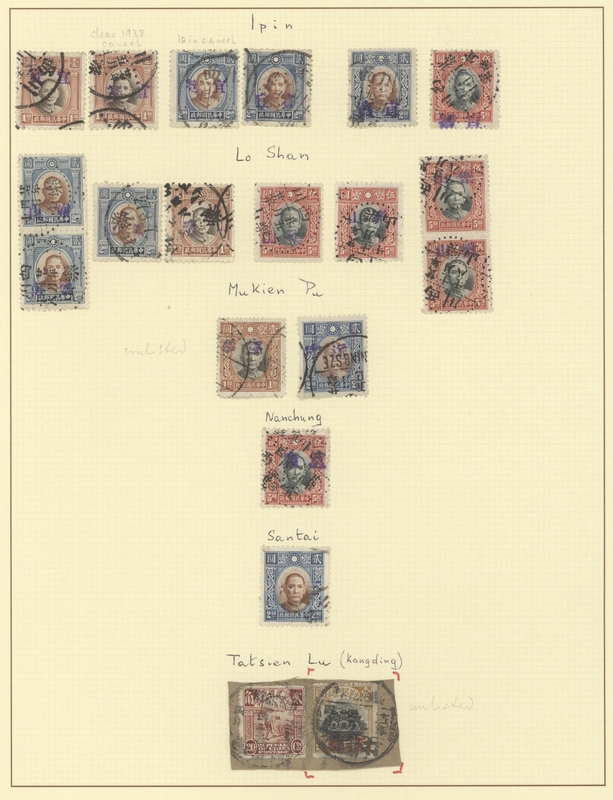 ), mixed bag with postal repair seals inc. Imperial (4 different) on 4 pages; R-labels on 3 pages; famine relief seals (18 mint/used); other seals (11 inc. imperial, coiling white dragon embossed into red). 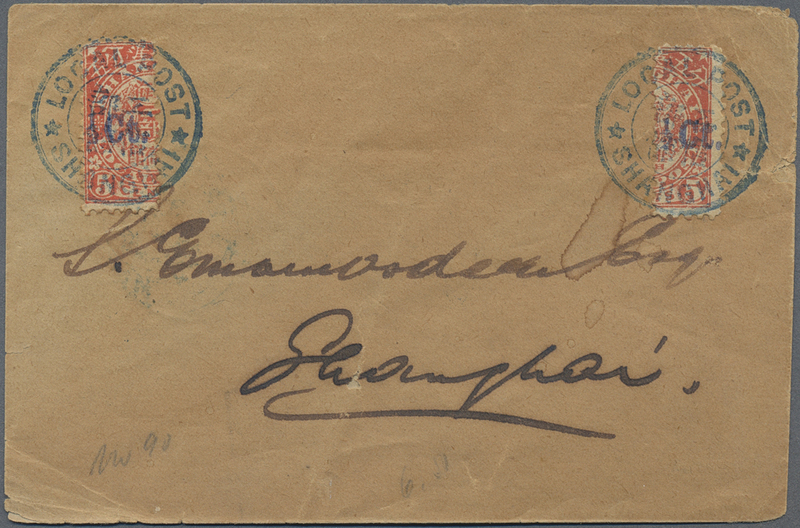 29524 ungebraucht (hinged) * ungebraucht ohne Gummi (unused without gum) (*) gestempelt (marked) 1912/60 (ca. 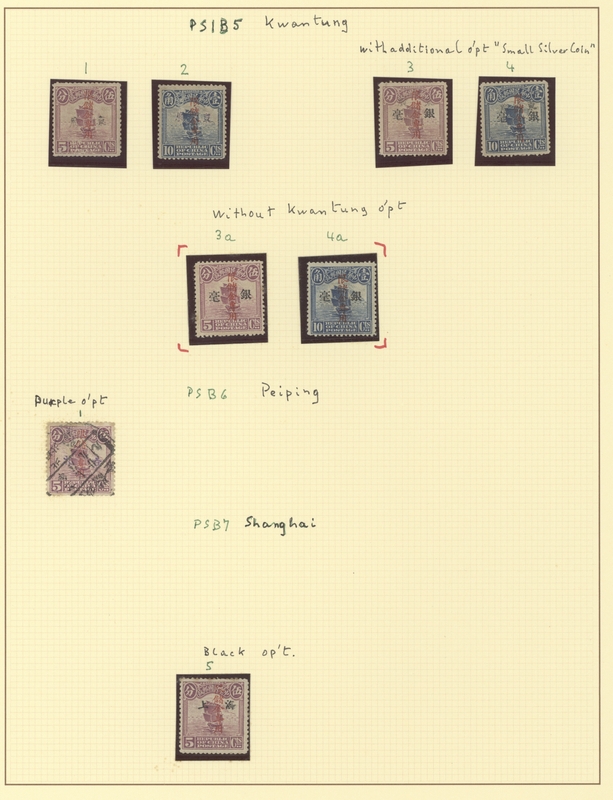 ), revenues/fiscals/tax stamps of Republic provinces inc. Sinkiang, Shantung, Insurance stamps of jap. 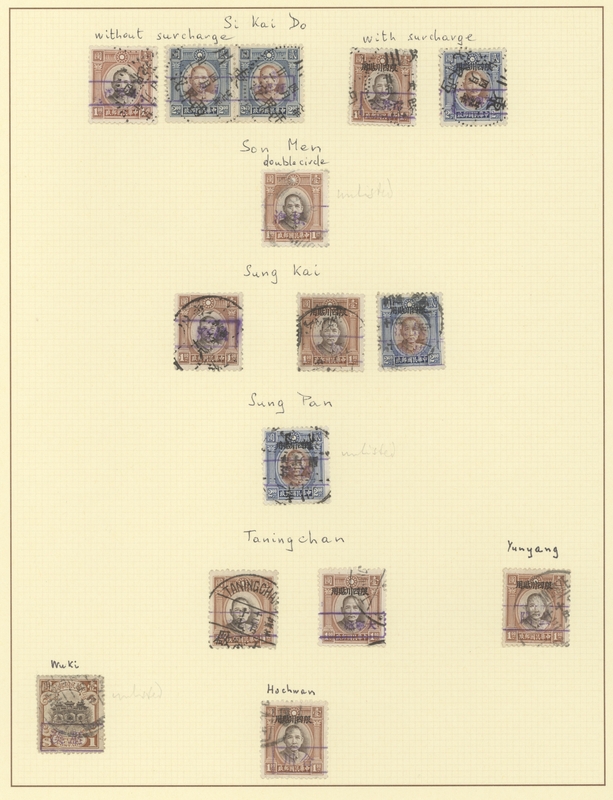 occupation NC, Kwangtung, court of law stamps, liquour tax, commodity tax e.g. 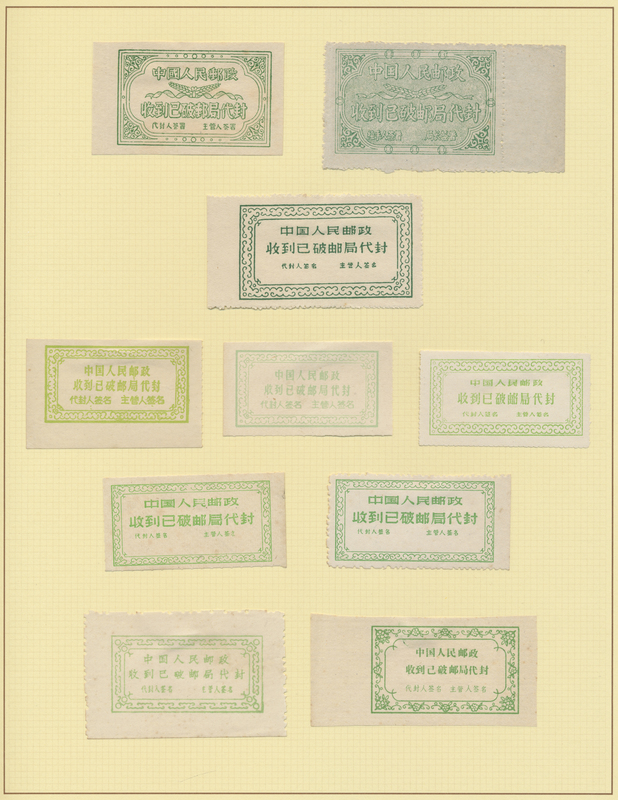 Liaoning tobacco, Inner Mongolia land tax, Manchuria parcel tax ec., 20 pp. + 7 pp. Taiwan. No entires. In boxed Lindner album. 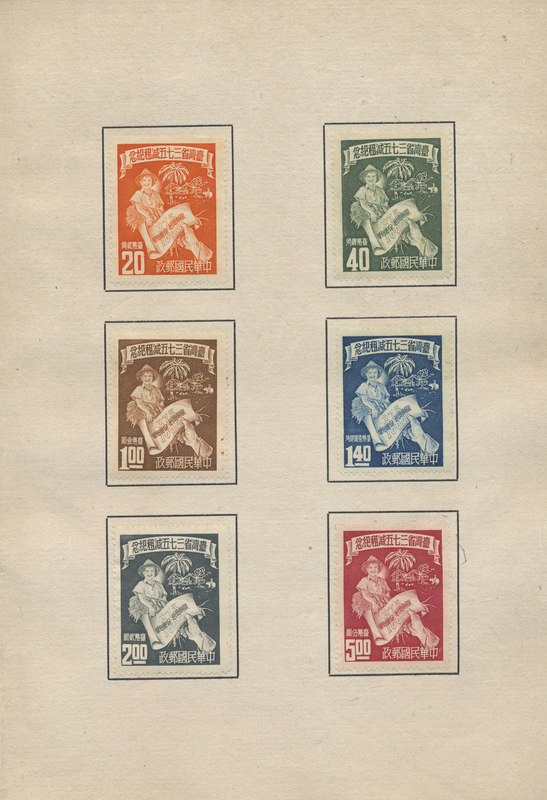 29525 ungebraucht (hinged) * ungebraucht ohne Gummi (unused without gum) (*) gestempelt (marked) 1919/44, postal savings stamps (Postsparmarken) mint and used collection, ovpts and regular issues, apprx. 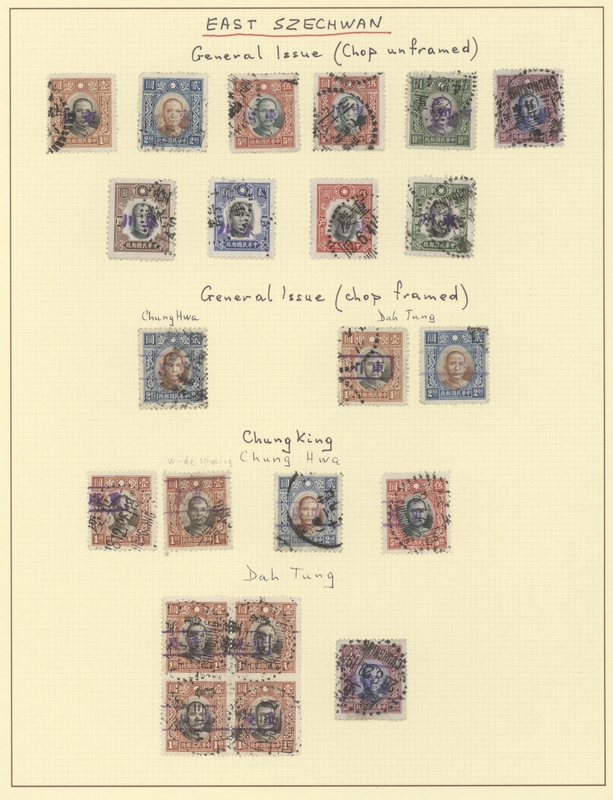 184 copies mounted on 13 pages and identified according Chan catalog, inc. Fukien 10 C., inverted surcharge, a mint block of four (Chan 1Cd). 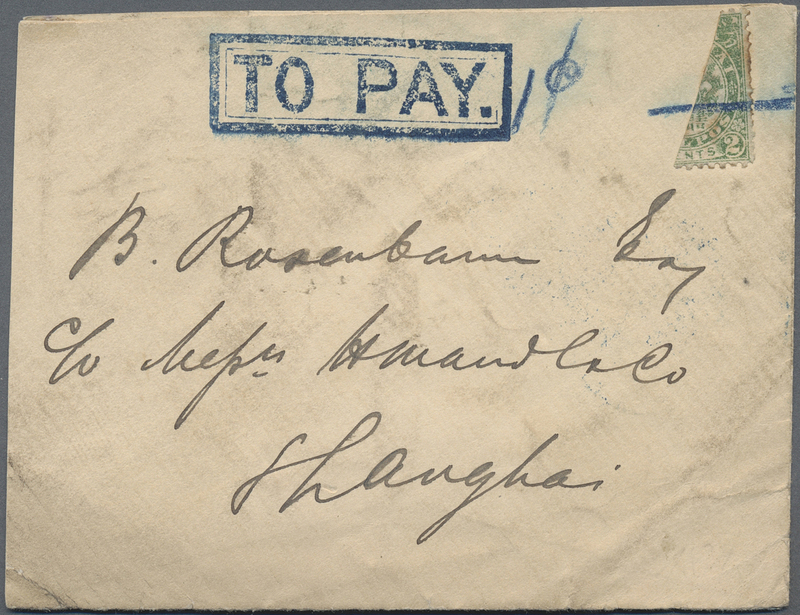 29526 ungebraucht (hinged) * gestempelt (marked) Briefstück (on piece) Anti Bandit chops, 1928/44, specialized collection of few mint and predominantly used on 11 pages: from Manchuria (6, inc. unlisted: green of Pingyangchen), Shenshi (4, inc. unlisted of Hanyin, West Szechwan (42 inc. unlisted: red of Tatsien Lu/Kangdin on hall of classics $1), East Szechwan (60), Kansu (46, inc. unlisted: Hsiaho x3, Tsikang; and Tienshui two strikes in violet and black on Dah Tung $10), and unidentified (4). Total ca. 162 copies mostly identified mounted on pages. 29527 ungebraucht (hinged) * gestempelt (marked) Brief (cover) 1947/53 (ca. 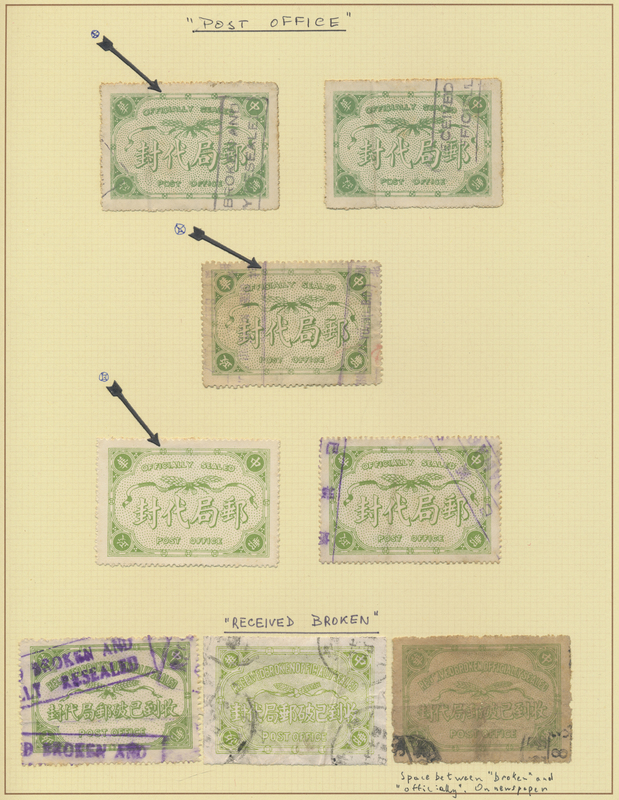 ), Money order stamps collection on pages inc. loose stamps (26 inc. imperf. 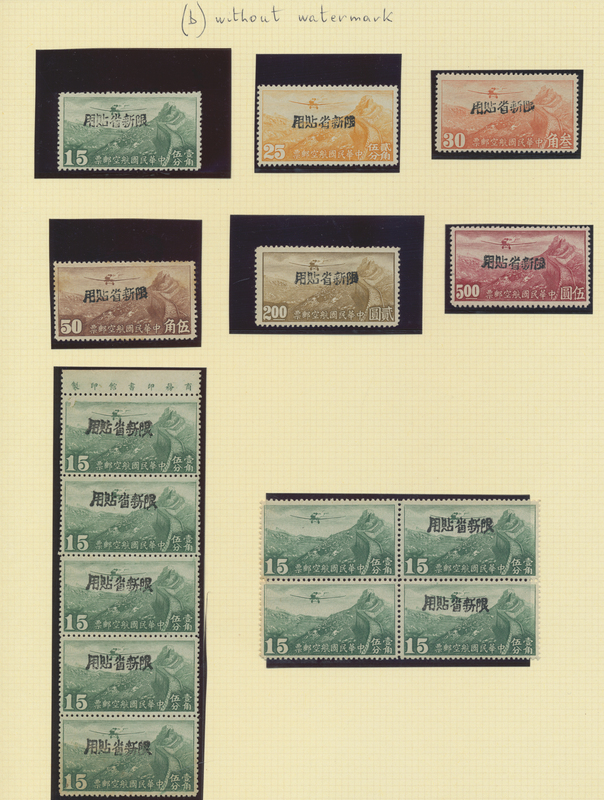 pair of $10 olive), entires (10 inc. one silver yuan surcharged from Kweichow area August 1949); plus Taiwan stamps (11), entires (2). 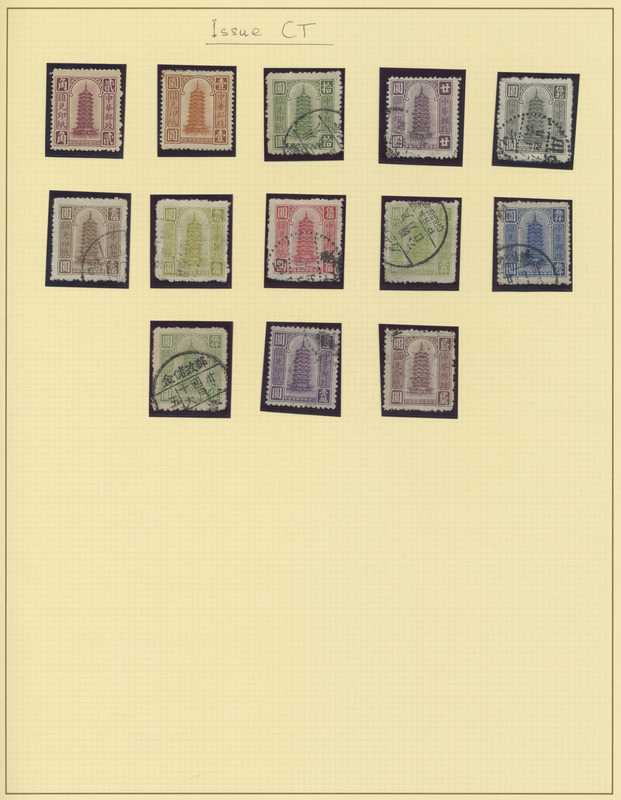 Total 37 stamps 19 entires, for specialists. 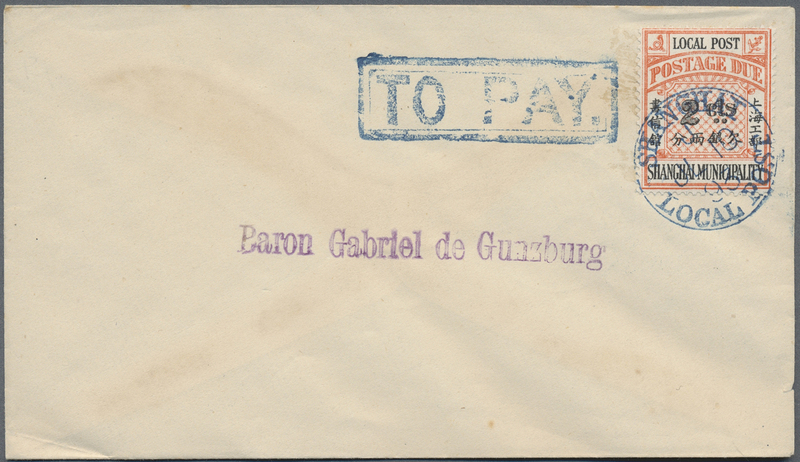 29528 ungebraucht ohne Gummi (unused without gum) (*) gestempelt (marked) Brief (cover) 1949/53 (ca. 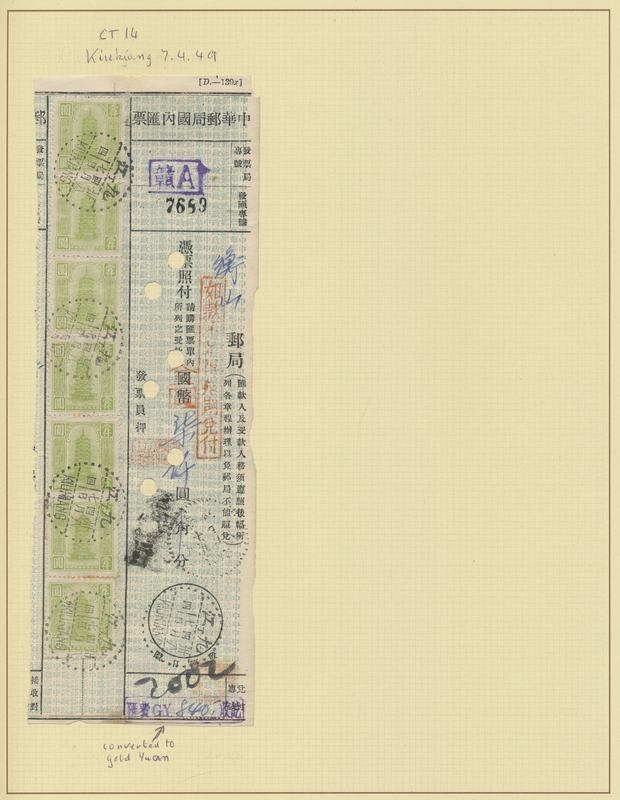 ), revenues/fiscals/tax stamps of the PRC inc. surcharges and provinces of Central-, North-, NE-, NW-, South, SW-china, Sinkiang, Inner Mongolia, city local issues like Shanghai mounted on 56 pages in boxed Lindner-album. Inc. 26 usages on documents. 29532 ungebraucht (hinged) * ungebraucht ohne Gummi (unused without gum) (*) gestempelt (marked) 1945/58, unused mounted mint resp. 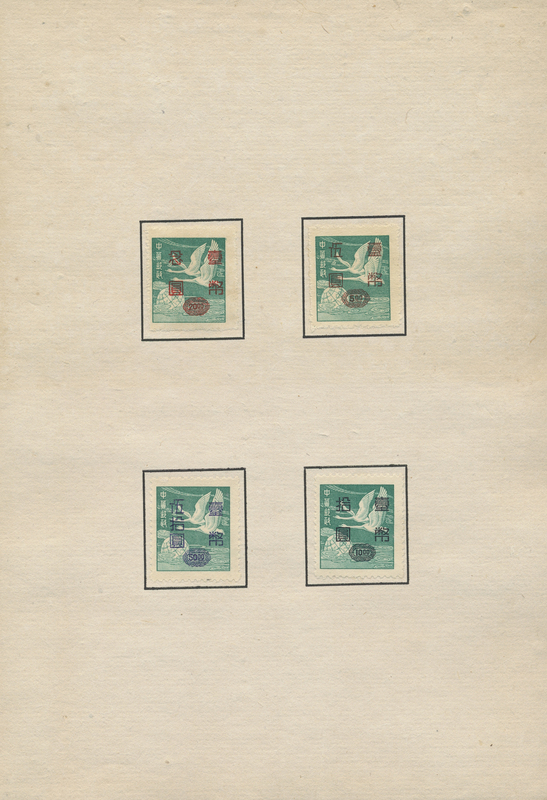 no gum as issued and used, mounted on pages in box, Michel cat. 2011 ca. 2000.-. 29533 ungebraucht ohne Gummi (unused without gum) (*) postfrisch (never hinged) ** gestempelt (marked) 1945/63, unused no gum as issued resp. 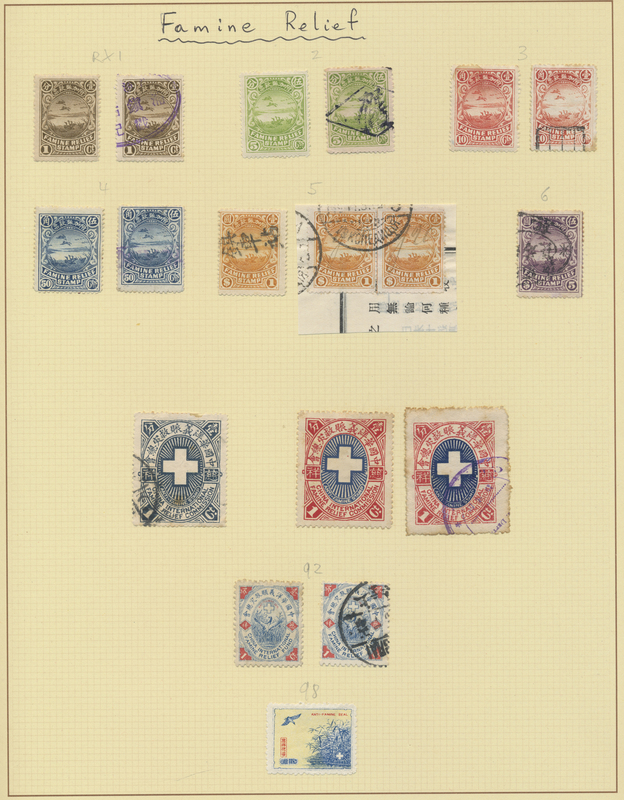 mnh and used collection, usually double collected on pages (mint in mounts) and few cto stationery in Lindner album inc. s/s #1 (slight crease), Michel cat. ca. 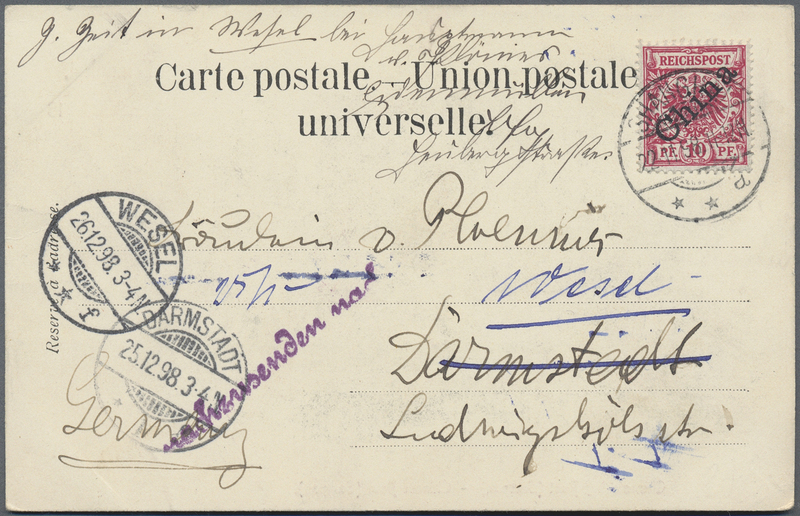 29536 postfrisch (never hinged) ** gestempelt (marked) 1947/83 (ca. 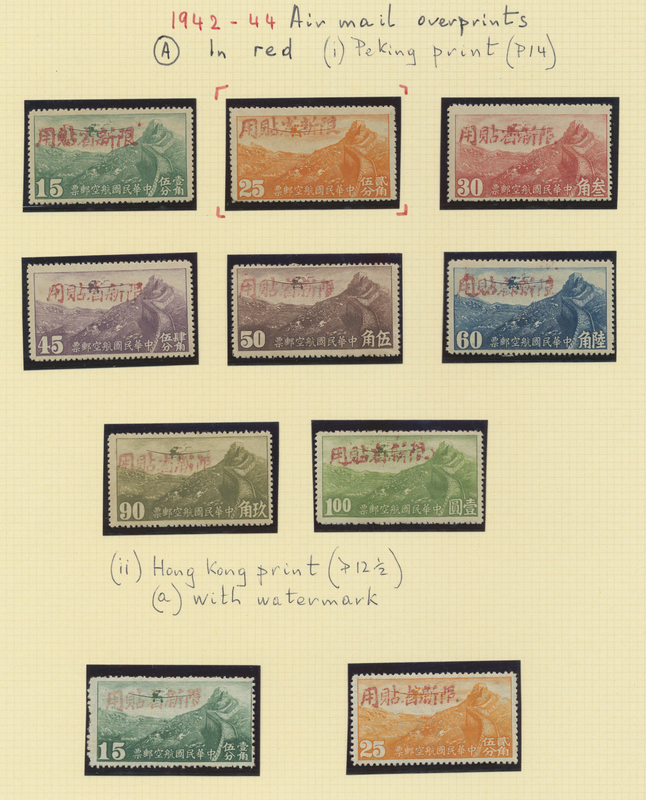 ), mint never hinged MNH and mostly used on stock cards.